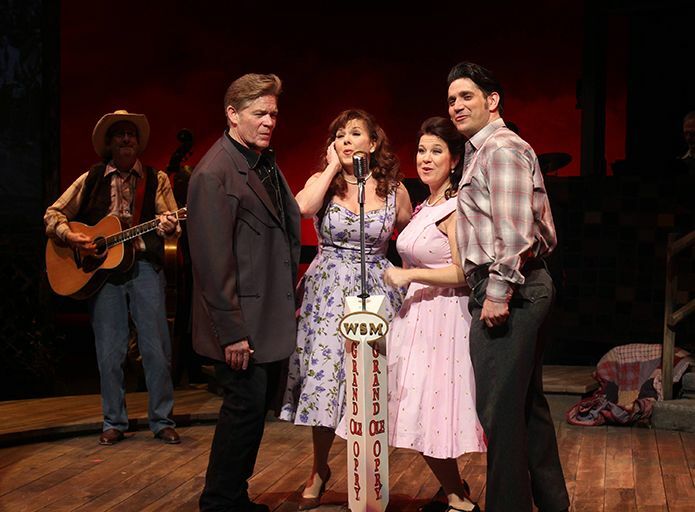 The cast of Ring of Fire: The Music of Johnny Cash. Photo by Sandy Underwood. Johnny Cash is firmly embedded in the fabric of American culture for his music. Cash was always cool, often charming. He was most definitely never cheesy. Fortunately RING OF FIRE: THE MUSIC OF JOHNNY CASH is heavy on the charming with only a few missteps into cheese. The best parts are those that feature director/principal Jason Edwards. His passion for Cash is evident in his direction; he is reverent with the material and life story of The Man in Black. And he sings his lyrics with great respect. He understands that the power is not in the vocal gymnastics in this songbook. Alison Briner gets that, too, though she certainly serves up some pretty spectacular singing especially early on. And while the other two principals (Trenna Barnes, Derek Keeling) have a couple of really nice moments (and INCREDIBLE voices), they sometimes play Johnny and June as caricatures of country music – something they most definitely were not. It is frustrating to go from a wonderfully tender performance of “I Still Miss Someone”, for instance, and then watch an over-the-top rendition of “Flushed From the Bathroom of Your Heart.” I’ve listened to recordings, watched archive footage, and neither Johnny nor June mugged for the audience. “A Boy Named Sue” was performed by Cash with a wink and a nod, not a toothy, scenery-chewing grin. Dialing down these moments would serve the show well. That said, this is a terrific musical revue. How can it not be with music of this quality – and musicians of this caliber? The mostly-Nashvillian band are unbelievable instrumentalists. And while they may not be the most comfortable actors and singers ever to be on stage, there’s something charming and authentic about their performances. The audience loved fiddle player, Brantley Kearns, from the beginning and for good reason. He is hilarious, yet his gut-wrenching news about Cash’s brother Jack and the accident that killed him brought tears to my eyes. What a wonderful treasure he is on stage throughout the show. The same goes for upright bass player John W. Marshall. I can’t say enough wonderful things about the music and the players in the band. The set is another knock-out; John Iacovelli has designed this show before with Edwards and he utilizes the Playhouse space very well. The costumes by Lou Bird are appropriate and serviceable. The sound is really fantastic, with only a handful of moments where it wasn’t perfect. Surprising given how rarely the Playhouse uses amplification, but they do know how to do it! The best part of this show is the way in which Edwards has adapted it and directed it. He took the concept by creators Richard Maltby and William Meade and made some changes that have appear to work well. There’s a cohesive story and the use of the principals and band members is well done. For the most part, transitions flow well from scene to scene and song to song. And again, his obvious love for the legacy of this American icon shines through in his performance. I really enjoyed myself, even with the nearly two-hour and thirty minute runtime. It’s a slice of American musical history that I think most people would enjoy, especially if you’re a fan of Johnny Cash, country music, or gorgeous singing voices and impeccable instrumentation. And this adaptation – due to the direction and talent on stage – is worth seeing even if you saw another version of this show elsewhere in town or anywhere else for that matter. RING OF FIRE: THE MUSIC OF JOHNNY CASH runs through February 15th and tickets are selling very fast. Click here to find out more. Previous FEATURE: She’s Crazy (and Other Mental Health Myths) is a Winner!